Fun Slime on Instagram -- A kind of hand mud, 4 pack DIY Slime kit,Just use your imagination freely. So smooth, stretchy & spreadable, soft hand feeling can give you the most wonderful slime experience. Eco-friendly Material -- ASTM certified, made of Purified water+Eco-friendly gelatin, no additives, and it is nonirritating to the skin or eyes and totally non-toxic,you will fall in love with this slime. 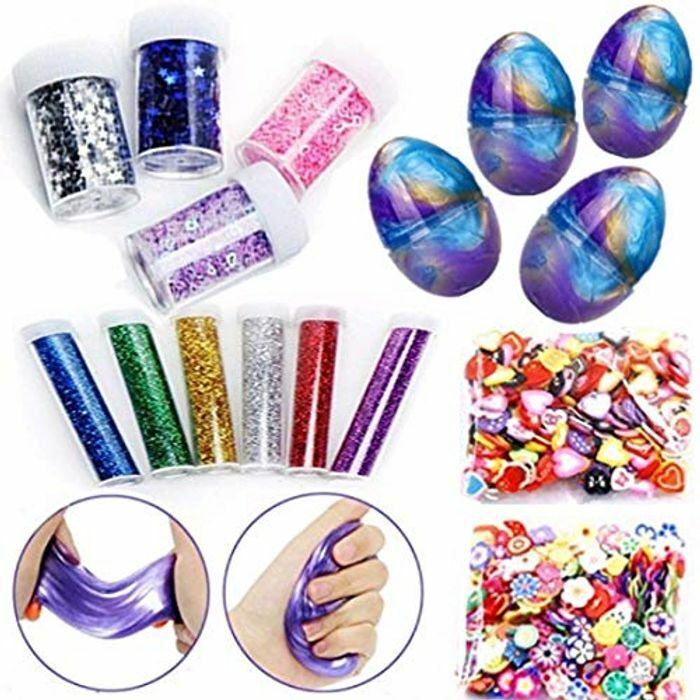 Galaxy Slime -- It is super soft with bright color, and looks like jelly, feels like soft ice, can fully meet kids strong curiosity, stretch, fold & pull the liquid glass putty to mold it into various shapes, easy modeling and DIY. Easy Storage -- Comes with a nice container which you can store your slime after playing with so it doesn't dry up.